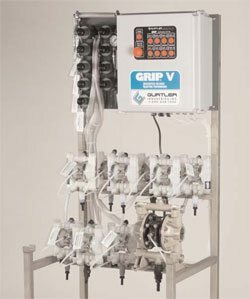 Gurtler GRIP Injection System - Gurtler Industries, Inc. GRIP IV and GRIP V are specially designed for optimum performance for either tunnel or washer-extractor laundry systems. Powered by highly accurate and durable air-operated diaphragm pumps, the GRIP IV is engineered to withstand the rigors of a tunnel washer that can call for injection as frequently as every 60 seconds. An operator touch screen provides easy and quick setup and a read-out of system status during operation. The GRIP can track up to 99 different wash formula classifications for maximum flexibility. All injection pumps are programmed with unique electronic controls that assure accurate and precise chemical delivery month after month. Their low-maintenance design allows your Gurtler representative to spend more time servicing your operation and not in the injection equipment. The GRIP pumps are all air-operated double-diaphragm, eliminating squeeze-tube replacement and failure issues. The double-diaphragm pumps are rated for 10 million strokes or 78,000 gallons of product delivery without maintenance! All chemical injections are verified to assure proper delivery every time. The expanded memory capabilities of the GRIP system allows for storage of up to five years of time-stamped data for both tunnels and washer extractors. The GRIP upright unit is engineered with a footprint as small as six square feet for operators who are short on space. The wall-mounted unit is designed for easy access and maintenance. Gurtler’s unique calibration tubes at tunnel injection sites provide an anti-siphon air break and an easy-to-use calibration and quality control tool.